Peirce was annoyed by this response (although it would have taken more than this to diminish his affection for James). He imme­diately set about revising his lectures, bestowing upon them the new title: Detached Ideas On Topics of Vital Importance. There was consider­able irony in this title, since Peirce thought there was little to be gained from either “detached ideas” or reasoning about “topics of vital impor­tance”. The latter was held up to particular ridicule in the draft of a new opening lecture that Peirce called “On Detached Ideas in General and on Vitally Important Topics” [1.649-677]. This draft is not available electron­ically, as far as I know, but it has influenced twentieth century Peirce scholarship through its inclusion in The Collected Papers of Charles Sanders Peirce. [Hartshorne and Weiss, 1931] What follows is my own gloss on this text — with extended quotations to help convey the flavor of Peirce’s writing. Peirce introduces a dichotomy — the indispensible tool of the polemicist — between reason and instinct. In passages that evoke Pascal he defends the claims of the heart over the head, leading to one of the most famous tag-lines in American philo­sophy. In regard to the greatest affairs of life, the wise man follows his heart and does not trust his head. This should be the method of every man, no matter how powerful his intellect. More so still, perhaps, if mathematics is too difficult for him. . . . Conservatism, true conservatism, which is sentimental conservatism, and by those who have no powers of observation to see what sort of men conservatives are, is often called stupid conservatism, an epithet far more applicable to the false conservatism that looks to see on which side bread is buttered — true conservatism, I say, means not trusting to reasonings about questions of vital importance but rather to hereditary instincts and traditional sentiments. . .
Again, the polemic derives from the opposition Peirce has constructed between reason and sentiment; that Peirce himself does not completely subscribe to this opposition is still submerged in the polemic. At this juncture, having trashed the sciences and the pretensions of reason, Peirce says something surprising — or, at least, something that would be surprising if we had no other exposure to Peirce’s thought. The sciences, Peirce says, “are all such that it would be far too little to say that they are valuable to us.” Given the tone of the pre­ceding, the word little comes as a distinct shock; one can almost hear how it might be delivered in a lecture. 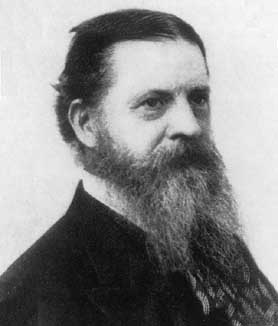 Peirce continues in this new voice, “Rather let our hearts murmur ‘blessed are we’ if the immo­lation of our being can weld together the smallest part of the great cosmos of ideas to which the sciences belong.” Peirce is recasting the polemic. The opposition between reason and sentiment — invariably re­solved, until now, in favor of the latter — apparently admits another resolution. Among vitally important truths there is one which I verily believe — and which men of infinitely deeper insight than mine have believed — to be solely supremely important. It is that vitally important facts are of all truths the veriest trifles. For the only vitally important matter is my concern, business, and duty — or yours. Now you and I — what are we? Mere cells of the social organism. Our deepest sentiment pronounces the verdict of our own insignificance. . .
As for thoughts, of late I seem to myself to be on the track of a great number of interesting topics in logic. Those lectures of poor C. S. Peirce that you devised will always remain quite epoch-making for me. They started me on such new tracks. If a man were immortal he could be perfectly sure of seeing the day when everything in which he had trusted should betray his trust, and, in short, of coming eventually to hopeless misery. He would break down, at last, as every great fortune, as every dynasty, as every civilization does. In place of this we have death. But what, without death, would happen to every man, with death must happen to some man. At the same time, death makes the number of our risks, of our inferences, finite, and so makes their mean result uncertain. The very idea of probability and of reasoning rests on the assumption that this number is indefinitely great. We are thus landed in the same difficulty as before, and I can see but one solution of it. It seems to me that we are driven to this, that logicality inexorably requires that our interests shall not be limited. They must not stop at our own fate, but must embrace the whole community. This community, again, must not be limited, but must extend to all races of beings with whom we can come into immediate or mediate relation. It must reach, however vaguely, beyond this geological epoch, beyond all bounds. He who would not sacrifice his own soul to save the whole world, is, as it seems to me, illogical in all his inferences, collectively. Citations are by volume and paragraph number from The Collected Papers of Charles Sanders Peirce, ed. Hartshorne and Weiss, Belknap, Harvard University Press, 1931. Correspondence cited is from The Thought and Character of William James, Ralph Barton Perry, Harvard University Press, 1935, Chapter XXXI.